Brochures | Arbeitsgemeinschaft Pflasterklinker e.V. You can download the Association of Clay Pavers brochures here by clicking on the pictures. Or fill in the order form to receive the print versions free of charge. 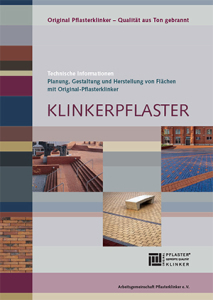 Original Clay Pavers „Klinkerpflaster“ – Technical Information. Planning, Design and Production of Original Clay Pavers on 100 pages (German Edition). • Design Advice for private use of Clay Pavers – Ideas for terraces and paths. Unfortunately this brochure is out of print but you can download the PDF version here. • Design Advice for public use of Clay Pavers- Ideas for use in public and commercial areas. • Info leaflet “Quality Mark”- contents of the Quality Mark. • Paving Instructions – This is the proper way to do it.